“Eternal Rotation” comes as quite a shock to many viewers: a goldfish bowl stands on a spinning washing machine. “Eternal Rotation” is a two channel video installation. Could you please describe how a viewer would ideally perceive it? How is it set up? The piece is installed as two life-size projections shown back-to-back on a single screen suspended in the middle of the gallery. 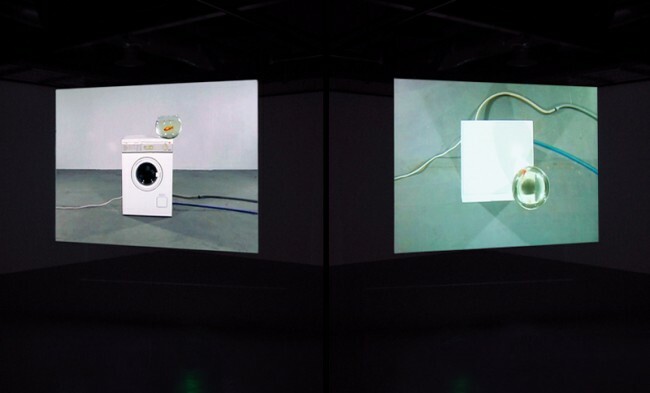 The projections show two camera angles of the washing machine, one angle is straight on showing the front of the washing machine and the other angle is showing the machine from above. The washing machine goes through a full cleaning cycle. After approximately one hour, during the spin-dry, the washing machine‘s movement makes the fish bowl slide off and crash on the floor. The screen is hung in the middle of a gallery space, so the viewer can circle the installation. The video runs on a loop, so there is no real entry or exit point. The viewer might not actually see much happening unless he or she was to spend a substantial time in the gallery. In terms of how long people normally spend looking at an artwork, an hour is really very long. One time, Warhol proposed to a gallery to show his films and they replied “These are the most boring films we’ve ever seen and we can’t imagine anyone would ever want to watch them.” Warhol replied “That’s what we think, too!” Often when I send proposals off, I think it’s a bit like this. However, the escapologist Harry Houdini said “The easiest way to attract a crowd is to let it be known that at a given time and place someone is going to attempt something that in the event of failure will mean sudden death.” I suppose I imagined “Eternal Rotation” to be somewhere in between these two extremes. A gold fish dying is often people’s first experience with death. I don’t think the piece is in any way shocking compared to switching on a TV. From the first moment you see “Eternal Rotation” you know what will happen: a disaster, a death. Many of your works (“Waiting To Fall“, “Life, Death And The Meaning Of The Universe“, “Pedestal“, “Mass Destruction“, “Heavenʻs Door“, “War Hole“) seem to be driving towards death, often a violent unnatural one. What is the fascination with death and disaster for you? I don’t really see it like that. I think as an artist you are most inspired by artists you like and I was never into abstract art or formalism. As a child I would always just draw or paint people. Then when I left school I worked as a portrait painter for a few years. I found the working process of being a painter alone in a studio totally boring. Then when I went to art school I initially got more and more into artists like Marcel Duchamp, Bruce Nauman and Yoko Ono. I just think their kind of work spoke to me much more. My work is still totally figurative though. If there aren’t people in the work itself, then it’s usually the audience becoming the figures in the piece. I think in terms of subject matter I have a very traditional art practice. The themes I use have been prevalent throughout the history of art. I think it’s a lot easier to make work about antagonisms of life. When you’re completely content you’re too busy lying in the sun eating ice cream to be bothered about making art. Maybe the themes of life and death were used primarily in religious art. To me, art is still like science or philosophy and at the end of the day it’s about trying to understand life. If anything, I see my work more as being life-affirming. I think art should be like a universal awareness practice that has the potential to render life into a much more appreciative activity. For me “Waiting To Fall” and “Life, Death And The Meaning Of The Universe” are about the beauty of existence, more than anything else. Although maybe some pieces like “Eternal Rotation” or “Waiting” deal more with the antagonisms of being alive. When everything seems hopeless humour can save the day. There is a cheeky humour in most of your works. Does the humour balance out the fatalistic aspects? Is waiting for death like waiting for a punchline? I don’t know really. I don’t intentionally try to make work with humour, I think it just happens. I grew up in the North of Ireland and lived in Scotland for ten years. I think humour is just a big part of everyday life in both places. It’s how we cope with the weather. Freud said, black humour is a way of telling ourselves that we cannot be affected by the traumas of the external world. So maybe any humour in my work expresses a defiance. I think humour and creativity are very similar in that they come at a moment when you connect different frameworks of reference in a new way. It’s this connecting of separate ideas in a way that generates new meaning. I was recently reading how the biggest technological advancements are made when someone comes along and just combines different things that already existed years before. Another theme that you have used in many of your works is the act of waiting itself (“Waiting“, “Waiting to Fall”, “Eternal Rotation”). Endurance seems to be important, as well as the thoughts that come while you wait for something to happen. Do you spend a lot of time waiting? Why is waiting so unbearable for many people? I think in the way gravity is omnipresent, we’re also always in a state of waiting, to some degree or another. Waiting for the weekend, waiting for the train, waiting for your friend to come, waiting for summer, etc. We’re all waiting for something. The people in your work are often subject to external forces. (“Waiting”, “Waiting to Fall”) They remind me of guinea pigs that have to go through experimental setups. Are you interested in scientific experiments? Yes, I like empirical investigations of “what ifs”. I like it when the “pursuit of the facts” is easily comprehensible. The subjects or objects in your works struggle with external forces such as gravity and time. They do endure for a while, but then comes the moment of collapse. In the end the external forces always win. What is your fascination with gravity? Is gravity a metaphor? Well, I think because gravity effects everything we do, it’s hard to avoid it. Gravity first featured strongly in installations I made before I started working with video. One of my first videos, “Waiting To Fall”, involved standing upright until I fell over from exhaustion. It ended up being very difficult to fall and it became necessary to use video to somehow capture the idea – the moment of collapse – as it happened. In “Waiting To Fall”, I think I wanted to make the piece not just about falling but also about the absurdity of existence itself. The idea that you come into life, stand about for a while on a huge ball, and then fall over and don’t exist anymore. I think this feeling runs through most of my work. The viewers are often in danger when they go to your shows. They could be killed by a falling piano, by an exploding gas cooker (“Mass Destruction”), by falling bricks (“Pedestal”) or an anvil placed on top of a door (“Heavenʻs Door”). Do you want to drag the viewers out of their comfort zones? Does art need to hurt? Should art be dangerous? There is a quote – I’m not sure by who – that says “Art should comfort the disturbed and disturb the comfortable”. I think there is a lot of truth in that. I suppose these works are very much about violence and destruction. But as with humour, I don’t set out to make work that could hurt people. I want to provoke an immediate response to the potential of the situation. Last year I was invited to re-make a piece I made in 2002 for the Golden Thread Gallery in Belfast. The work is an installation called “Mass Destruction” which consists of a gas cooker, a gas cylinder, and a burning candle. The oven door was left open and the candle was placed a short distance away. The audience was confronted with the opportunity to turn on the gas and to completely obliterate the gallery. I think it is interesting that you can have all of these objects in your kitchen and you never think about them in a sinister way. However, when you isolate and arrange them in a certain way, it totally changes and is capable of subverting the sanctity of the art space. You grew up and studied in Belfast (Northern Ireland) and then lived in Glasgow before you started working in Berlin. Belfast is known for its political conflict and Glasgow has a reputation for being a very tough city as well. Do you think violence is an aspect of your work because of where you live? I’m not sure, but I don’t think so. While completing my undergraduate degree in Belfast, I became very much influenced by the direct approach of performance art that was pervasive in Northern Ireland at the time. Perhaps due to the political situation, Northern Ireland has had a long track record of both creating and reflecting upon art practices that address social and political issues through art. Maybe I was influenced by that, more than actually by living there. Violence is everywhere, especially where you have inequality, you’re always going to have conflict. There’s a psycho-social stress caused by that inequality, too. With our advancements in science and technology today, there’s absolutely no reason for anyone to be in poverty and it’s crazy how we have these massive wealth gaps. I think that’s where the real violence stems from and maybe some artworks reflect the pointlessness of this, more so than being about where I have lived. 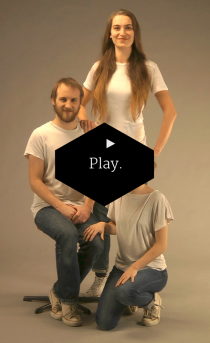 If they are not in danger themselves, your viewers have to endure video installations of an hours length while standing (“Waiting”, “Eternal Rotation”). Your videos have no cuts, and the camera does not move. This at first is very hard to watch but there is enough suspense to keep people interested, even if they are just watching something as boring as the full cycle of a washing machine. Is the physical endurance of watching your work part of the work itself? Yes, totally. I spent a lot of time thinking about the filming and the set up of my video and installation works. I try to make the recording of the ‘situation’ and later the presentation of the footage as close to the procedure as possible. I think this is the best way of getting across what you are trying to communicate. I think if the viewer stands and waits and feels gravity’s pull, this allows for more empathy towards what is happening in the video. Although, I’m always surprised how long people actually stay and watch the work. Do you know how many performance artists it takes to change a light-bulb? No, I don‘t. I left after two and a half hours. How important is the context in which your works get shown? Why do you normally not show your video works online? It’s very important. Because the pieces have no real narrative and the content is so condensed and minimal already, it’s really the installation parameters, the scale, the sound and duration that communicate the idea. The gravity and waiting aspects are also lost online. Your works do seem very minimalistic in form. However, the ideas have many layers of meaning. When one looks more closely, they really open up and many associations take shape. At first one might think that the works are all about death and destruction but through the use of humour one is reminded that those are necessary aspects of life. Without death and destruction there actually would be no life. There are many deep thoughts and philosophical concepts condensed in this seemingly minimalistic form. How do you develop your ideas? How is your working process? I don’t have a traditional studio practice, unless I’m doing a residency or making screen prints or something like that. I really just read and collect information that I am interested in. Although over the last few years, I have not been reading as many books and have spent too much time on the computer. I never feel I make an artwork about one specific thing, like everyone I have a lot of different thoughts about a lot of different things, and then I think my best ideas manage to encapsulate a few different thoughts about life simultaneously. I see making an artwork like making a mind map backwards. Instead of starting with a central concept in the middle I have a lot of different ideas that are maybe connected or branch out into other notions and then the artwork or central concept of an idea appears later. I wouldn’t expect a viewer to think about an artwork as much as I do, but I think if it works visually to begin with, that’s a good starting point. After that, one can only hope the viewer might be more deeply interested. I try to make pieces that hopefully work on a lot of different levels. For some people it might even be just the pleasure of watching something getting smashed. To me, “Eternal Rotation” also speaks about the struggle between nature and technology. The process of mechanical cleaning pollutes the water that the fish needs to live in. The machines we create seem to threaten life itself. The cycle is spinning faster and faster. Are you afraid of environmental collapse and global warming? Or is this also just part of the eternal rotation of life? To quote the artist Lauren Bon “Artists need to create on the same scale that society has the capacity to destroy.” I’m not really afraid of the environmental collapse and global warming as there is not a lot I can do about it. But I am aware of the fact that at the moment our way of life is more than unsustainable: and maybe, like in “Eternal Rotation” the system is driving itself towards collapse. Like most people, I’m aware that humanity is facing huge difficulties, and our future seems to be less predictable and more complex than ever. But in general, I’m optimistic about the future. I think the importance of the arts is that it gives us insights into our reality. At the moment, I am fascinated by how activists, hackers and journalists are using media and technology to respond to the current geo-political and economical situation. For example, they are coming up with very exciting ideas of how to make the most out of our resources. At the same time, computer programmers are creating new digital money systems that bypass the banks. I think it is a really exciting time to be alive. 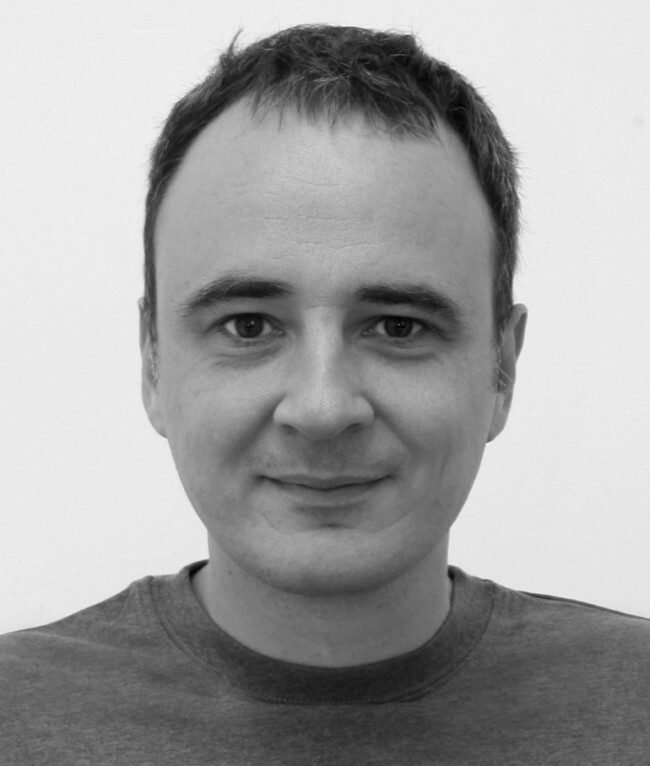 Maurice Doherty is a multi media artist living in Berlin and Belfast. He graduated from the University of Ulster (Belfast) in 1997 and completed a Masters in Fine Art at the Glasgow School of Art in 2001. Doherty has had solo exhibitions at Beursschouwburg (Brussels, Belgium) Schalter Gallery (Berlin, Germany), Glasgow Science Centre (Scotland), Catalyst Arts (Belfast, Northern Ireland), The Floating Series (Berlin, Tramway (Glasgow), Collective Gallery (Edinburgh, The Slug and Lettuce (Glasgow). Recent group exhibitions include Wolkenbank Galerie (Rostock, Germany) STANDARDS (Rennes, France), Queens Park Railway Club (Glasgow), Kreuzberg Pavillon (Berlin), Golden Thread Gallery (Belfast), Grimmuseum (Berlin), LAGE EGAL, (Berlin), Scope Art Fair (New York, USA). Forthcoming solo exhibitions in 2014 include Galerie Four (Baltimore, USA) and Maniere Noire Gallery (Berlin).